Acrylic Sealer is a pure acrylic coating for AC100. It is durable, flexible, and UV resistant. The formulation has been improved to make the material more Matt in appearance and easier to apply by brush or spray. Dependent upon prevailing conditions, products sealed with Acrylic Sealer will require re-coating at 6 –10 year intervals. It is also compatible with AC300, however it would not provide the same level of external protection. We recommend that two coats of Acrylic Sealer should be applied onto low porosity surfaces such as AC100, with the first coat being diluted with 10 – 20% water. Diluting the first coat will aid the chemical bond of the Acrylic Sealer onto the material surface. The second coat is applied once the first coat is touch-dry. Do not allow first coat to dry completely before applying the second coat. In principle the application of several thin coats is preferable to one thick coat. Acrylic Sealer should be applied with a high quality brush or with a clean high quality dense foam roller evenly across the surface. Ensure that all surfaces are clean, dry, and free from any grease or oil. 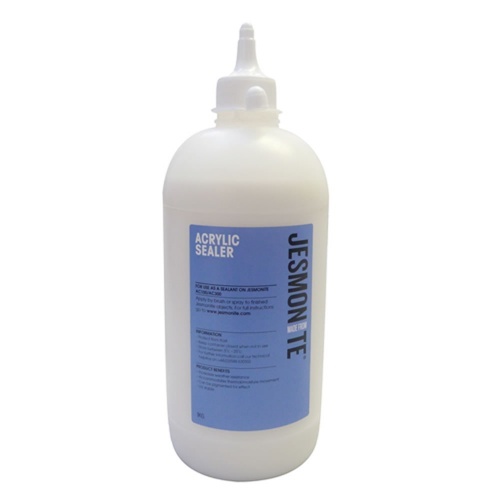 Acrylic Sealer can also be diluted with water and pigmented using Jesmonite Paste Pigments to create colour washes to add a patina or to age casts.